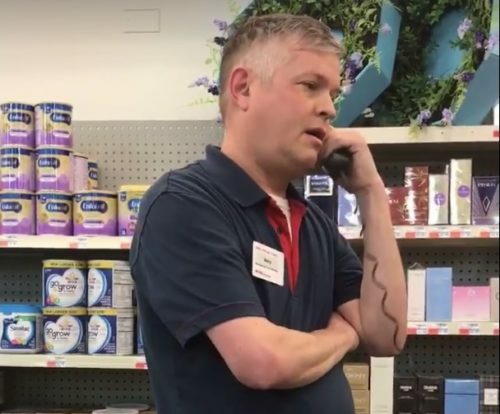 A white, gay Republican drugstore manager who called the police on a black woman who used a coupon has been fired. And that was only the beginning of his comeuppance. CVS manager Morry Matson and another, unnamed employee were fired after they called the police on Camilla Hudson, 53, for attempting to use a coupon that they believed was fraudulant. Video of the call went viral, and Matson – the president of the Illinois chapter of the Log Cabin Republicans – was dubbed “Coupon Carl” on the internet. Last Friday, Hudson went to a CVS in Edgewater, Chicago, with a slip mailed to her by the manufacturer of a personal care product. She got the slip to replace a defective model that she had previously purchased. The item cost $17.99. Hudson told the Washington Post that, at first, Matson helped her. But while she was waiting in line for self-checkout, another employee approached her and said that he had never seen the coupon before and that it was probably fraudulent. The second employee walked away. Matson approached Hudson and told her that she had better leave, that he had already called the police. She said that she would wait for the police. Hudson started filming as Matson called 911 to report an “assault.” That part of the incident went viral when she posted it to Facebook. Three officers showed up and Hudson was still there. The Chicago Police Department took no action and did not file a report about the incident. CVS issued a statement on Monday promising to investigate the incident. Later in the day, Matson and the other employee were fired. “We have completed our investigation, and as a result the two colleagues who were involved are no longer employed by CVS Health,” a CVS spokesperson told the Chicago Tribune. Log Cabin Republicans Chapter Leaders have a duty to conduct themselves in a manner becoming of an organization advocating equality and inclusion of all Americans — whether or not they are acting in an official capacity on behalf of LCR or otherwise. As news articles highlighting Mr. Matson’s actions from this past weekend show, not doing so can have detrimental consequences not only for individual Chapters, but for the national organization as a whole. As such, the provisional charter afforded to LCR Illinois under its newly reconstituted leadership has been terminated. Hudson’s post on the incident was censored by Facebook over the weekend. On Monday, she found herself locked out of her account without an explanation.